Margaret Tweet has some thoughts about vaccines. During meetings held this week by the Clark County Council, a reoccurring and unsurprising topic kept coming up: measles. The county’s outbreak of measles has now risen to 42 cases and has spread to Oregon and the Seattle area. Clark County Public Health has been very busy trying to address the outbreak. The subject has also been on the mind of at least one member of the public who showed up to the council’s public comment period Tuesday morning. “I’m here today to encourage more complete information to the public regarding adverse reactions to vaccines and how to report an adverse reaction,” Margaret Tweet told the council. She asked the county to provide a link to the Vaccine Adverse Event Reporting System, a system to monitor the safety of vaccines that’s run by the federal government. She cited an article showing that a search of the reporting system over a period of 10 years beginning in 2004 found 108 deaths associated with the measles vaccine. She also said that there are other adverse effects associated with the vaccine that had been reported, such as encephalitis and other frightening diseases with hard-to-spell names. Tweet also suggested that “vaccine-induced measles” could be spread to others. After she completed her remarks, the council asked Dr. Alan Melnick, director of Clark County Public Health, to respond. “There is a lot of misinformation going around on social media,” he said. Essentially, Melnick said that any risks posed by the vaccine, which he called “incredibly safe,” are very small and are outweighed by risks posed by actually getting measles. “Before the vaccine was available in the U.S. there were 4,000 cases of encephalitis from measles every year,” said Melnick. Encephalitis, explained Melnick, is the swelling of the brain and can cause deafness. He said that while it’s possible that children can have fever-induced seizures from the vaccine (which he called “benign”), he said it’s much more likely that will happen from actually getting measles. “There has been study after study after study on the measles vaccine looking at large populations, and the vaccine is safe,” said Melnick. “So you’re saying that 104 deaths in 10 years probably wasn’t from the vaccine?” asked Quiring. “I would virtually guarantee that, yes,” replied Melnick. But the council still wasn’t done talking about measles. State Reps. Monica Stonier, D-Vancouver, and Paul Harris, R-Vancouver, have introduced a bill that would get rid of the state’s personal exemption for the measles, mumps and rubella vaccination. While the state grants medical and religious exemptions for vaccinations, the personal exemption is the most widely used. During the council’s Wednesday afternoon council time meeting, the question before councilors was to add the bill to the county’s legislative agenda. Quiring said that there are kids who may use the personal exemption because they’ve transferred from various schools and don’t have access to their records. “It’s a matter of falling through the cracks,” she said. Councilor Temple Lentz said that a foundational public health bill being considered by the Legislature could help with kids who have fallen through the cracks. “But as we are seeing right now, all the confirmed cases are people who aren’t vaccinated and the public resources that are being spent controlling this outbreak should be of concern to everybody,” said Lentz. 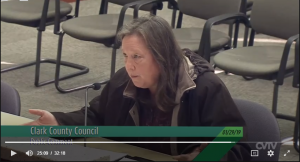 Councilor Julie Olson agreed, saying that the public health system is being significantly burdened because of decisions of families not to vaccinate their kids. Councilor John Blom also agreed, pointing out that Washington is one of just 18 states that allow for a personal exemption. “I’m not sure you can say that,” said Quiring. “That it’s all based on erroneous information,” said Quiring. Medvigy said that he relies on information from the Centers For Disease Control and Prevention, as does Melnick. At the end of the discussion, Quiring realized the council was supportive of adding the bill to its legislative agenda. “I can count,” said Quiring with a laugh.